A-HOTEL.com - Luxury and cheap accommodation in Hangzhou, China. Prices and hotel, apartment booking in Hangzhou and surrounding. This indicative offer was derived from the most recently booked accommodation in Hangzhou and sort by the price, from cheapest Hangzhou accommodation to the most expensive hotels. To select accommodation by your preferences we recommend to choose from 576 accommodation offers in Hangzhou in total. By entering the dates of your overnight stay in Hangzhou and using the filter tools you can sort the best possible accommodation for you. The entered dates of your stay are crucial for the most accurate offer as it derives all the online information on pricing and availability of Hangzhou accommodation. Then you can book the selected Hangzhou lodging (hotels, apartments etc.) immediately. Situated within 3.8 km of Wushan Square, EBO Hotels Hangzhou Wulinmen in Hangzhou features a number of amenities including a garden, a terrace and a shared lounge. JW Marriott Hotel Hangzhou is located near Wulin Square, a 10-minute drive from the scenic West Lake and a 3-minute walk from Hangzhou Tower shopping mall. Adjacent to The Grand Canal, the stylish hotel features an indoor pool, a 24-hour fitness centre and free parking. Wyndham Hangzhou offers spacious comfortable rooms with free Wi-Fi and private balcony with views of Hangzhou city or West Lake. Located at the north-east corner of West Lake, it is a 10-minute walk from famous tourist spots like Duanqiao Canxue. Offering a terrace and views of the Qiantang river, Hangzhou Marriott Hotel Qianjiang is situated in Hangzhou CBD Area of Qianjiang New Area, 5 km from Wushan Square. Guests can enjoy the on-site restaurant. Located in the Binjiang district of Hangzhou, Wisetrip Riverside Apartments is 10 km from Wushan Square. Built in 2017, the property is within 16 km of Lingyin Temple. Located in the heart of the city, Midtown Shangri-La Hangzhou amazes you with well-furnished guestrooms, exquisite cuisine at the 4 on-site restaurants and luxurious banquet halls. The property is central to Hangzhou Kerry Centre, the large-scale urban complexes in downtown and guests are close to big shopping plazas. Huachen International Hotel is a stylish hotel located around a 10-minute walk from the West Lake. It offers modern accommodation with 2 restaurants, free parking and free internet in rooms. Summer Flower Apartment is situated in Hangzhou, 1.6 km from Wushan Square. Sitting in the northwest corner of the alluring West Lake, Four Seasons Hotel Hangzhou at West Lake boasts views of traditional Chinese gardens from most units. Four Seasons Hotel Hangzhou at West Lake is around a 10-minute walk from West Lake Impression show theatre. Standing on the beautiful shore of Hangzhou's West Lake, the luxurious Shangri-La Hotel occupies 40 acres of rolling hills and lush greenery. It offers 3 dining options, an indoor pool and outdoor tennis courts. 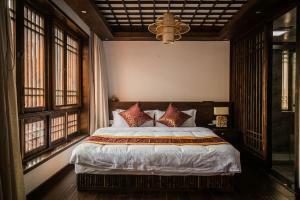 Located in the Xihu district of Hangzhou, Jiu Jian Tang Inn is 700 metres from Lingyin Temple and 6 km from Xixi Wetland. The property is around 7 km from Wushan Square and 3. InterContinental Hangzhou is located in beautiful and scenic Hangzhou Qianjiang CBD. It is directly adjacent to Metro Civi Centre Station (Line 4). Located in the heart of West Lake area in Hangzhou, Westlake Service Apartment offers accommodation a 12-minute walk from West Lake. Complimentary WiFi is featured in all rooms. Delicately designed by local artists, Hangzhou Nook Hotel welcomes guests with art space and upscale accommodation. Blending wooden base with multiple materials as stone, glass and aluminum, the hotel is furnished with local-inspired artworks of photography and furniture. Set beside the beautiful West Lake, Sofitel Hangzhou Westlake features morden guestrooms with captivating views. It offers an indoor pool, a spa centre and 2 restaurants. Situated in Hangzhou, Blooming Lotus.Theme house. Situated along Hushu South Road in Gongshu District, The East Hotel offers a fitness centre and free Wi-Fi throughout. A 5-minute walk from Wulin Square, it is a short 10-minute drive from the stunning West Lake and Grand Canal. Courtyard Hangzhou Wulin is located in the heart of Hangzhou, a 10-minute drive from the famous West Lake. Featuring views of The Grand Canal, it offers an indoor pool, free parking and free Wi-Fi access. Sheraton Grand Hangzhou Wetland Park Resort is located next to Xixi National Wetland Park and 5 km from the West Lake and Lingyin Temple. The resort combines traditional Chinese architecture alongside sleek and tasteful furnishing in soothing natural colours, offering landscape views of the signature gardens of Hangzhou. Located in EAC Commercial Centre, adjacent to Yellow Dragon Entertainment Complex, Oakwood Residence Hangzhou is a 10-minute drive from West Lake and Wulin Square. The hotel features free WiFi in all areas, an indoor pool and flat-screen TVs in rooms.